Because nothing says 'stability' like a Central Bank in charge of things, the smartest richest men in the world have proclaimed in Davos this week that "we need a central bank of oil, like the central bank in financial world." As long as they are not Swiss, of course. Oil has been volatile today amid these calls for stability after Saudi Aramco comments on cutting projects (supply) sent prices higher, and was then talked back by the CEO bringing prices lower. Oman - the largest non-OPEC Middle East oil producer - blasted that "we have created volatility," noting it was having a "really difficult time," and that's "bad for business," demanding OPEC slow production. 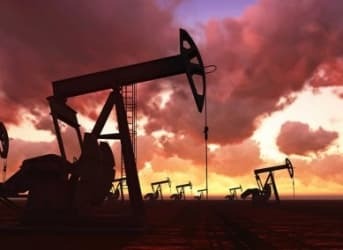 But it was The IMF that sparked the greatest concerns as it warned oil producers to treat this oil price drop as permanent noting that they expect these economies to lose $300 billion. Only to be contradicted by OPEC's al-Badri who noted "oil prices will rebound back to normal soon." So less supply - buy... But then..
Oman, the biggest Middle Eastern oil producer that’s not a member of OPEC, joined Venezuela and Iran in questioning the group’s decision to keep its output target unchanged even with crude prices falling. Oman is having a “really difficult time” because of low oil prices, Oman’s Oil Minister Mohammed Al-Rumhy said at a conference in Kuwait City. The 2015 budget of Oman, where oil and natural gas account for 79 percent of government revenue, is based on an average crude price of $85 a barrel, Finance Minister Darwish Al Balushi said in November. OPEC Secretary-General Abdullah al-Badri said oil prices would soon recover after falling more than 50 percent since June. "The price will rebound and we will go back to normal very soon," said Al-Badri, addressing the World Economic Forum in Davos, Switzerland. The Middle East is the most stable area on the planet. So yes, the IMF is correct, low oil prices are going to be permanent /sarc.